Studying every component of the Texas Hold’Em game is very important. This is what serious players do. If you’re a newcomer to the world of poker, you’re probably playing a lot of hands based on your gut emotions about it, and that’s not really the best way to play poker at all. You’re going to want to make sure that you are truly studying the game from every angle in order to improve your game. A lot of people have emailed us asking what it takes to make big money like the guys and gals on TV playing poker. The reality is that there’s a lot of study involved that a lot of people don’t really want to do. And this is why they never reach their goals of doing really great at poker. That’s something that really makes all of the difference in the world when it comes to getting the prize pots that you’re after. So let’s get into the dirty details, shall we? Online Hold’Em is all about looking at structure, because you don’t have physical tells. You have to make sure that you look at the flop itself — the first three cards that come down after pre-flop betting has ended. It’s all about looking at the structure. You want to make sure that you are following these three cards carefully. 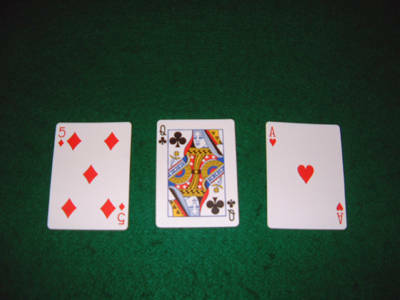 For example, 8s – 10c – 3d is what would be considered a “ragged flop”. You have no suited, connecting, or high cards. It’s not going to be a flop that really connects with anyone either. However, you will need to be on the look out for pocket pairs. Someone can easily have a three of a kind without letting you know that. Remember, you can’t see your opponents so you’re going to have to look at how they actually bet. A flop that should get your attention would be something like Td Jd Jc — someone who has pocket J’s is going to mop the floor with you, while someone else has a good chance of getting a flush. Don’t just think yourself okay because you have another pocket pair. You may be up against some stiff competition. As you might imagine, it’s all about studying to see how suited and connected the flop is. Is someone going to be able to chase a straight or a flush? Is the board paired? You have to simultaneously look at what’s good for your opponents, and what’s good for you. You don’t want to be the fish that leaps into a pot that looks good without realizing that it probably looks tantalizing to everyone else at the table. It’s a good way to get pushed out of your chips. Thinking about poker in this way may take some time, and that’s perfectly okay. there’s nothing that says that you have to master everything overnight. A lot of these things will have to come through practice — and you should embrace that. The more that you practice, the more that these steps become ingrained into memory. You won’t need to consult a guide — you’ll make the right sequence of choices automatically. Start today!